Manchester United FC (Eng. 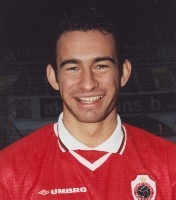 )(1994-2000), R Antwerp FC (1)(1998-1999 - leen), Derby County FC (Eng. )(2000-2003), Southampton FC (Eng. )(2003-2006), Stoke City FC (Eng. )(2006-2007), Sunderland AFC (Eng. )(2007-2008), Stoke City FC (Eng. )(2008-jan.2013), Nottingham Forest FC (Eng. )(jan.2012-2012 - leen), Ipswich Town FC (Eng. )(2012-dec.2012 - leen), Sheffield United FC (Eng. )(jan.2013-aug.2013), Chester FC (Eng. )(sept.2013-dec.2013), Altrincham FC (Eng. )(jan.2014-2014).